I worked for many hours with my Dad last Saturday cleaning out their house, and my wife dropped off some Indian food from the Whole Foods hot bar, including a red-lentil soup (dhal). There was enough leftover of the dhal to use in tonight's meal, my Dad's last dinner with us until he visits again. In addition, I came up with what proved to be a very nice idea for using brown rice noodles. I soaked some noodles in hot tap water for about 20m. I cut half of a medium onion into thin half moons and started sauteeing the onion for a few minutes. While still clear, I drained the noodles and hand tore them roughly into halves, then added them a few at a time, stirring to avoid clumping. When the noodles were cooked in a few minutes, I removed the heat and added about 2 tablespoonfuls of soy aminos and 1/2 teaspoonful or so of the wonderful locally made Pluto's Caribbean Bliss jerk seasoning (I used a salt-free variety). I served with corn-off-the-cob with Earth Balance margarine, a little bit of fresh lemon juice, a pinch of salt, and a pinch of dried oregano. We all enjoyed the dinner and I was particularly pleased with the noodles. I've had problems with the noodles sticking together, but adding a little bit at a time and stirring did the trick. I'd love to try other dishes with stir-fried noodles, maybe integrating some additional vegetables. We have very nice new neighbors who are taking over living in my parents' home. They moved in today - they have two children, a baby and a child just a little older than my daughter. To help welcome them, we offered, and they accepted a home cooked meal brought over to them. My wife doesn't like Mexican food (I do! ), but I had some taco shells that I brought over from my parents' house as I was cleaning it out. I sauteed some onion and seitan, adding kale when the seitan was browned. I cooked the kale down just for a few minutes, then added corn kernels off of a cob, and cooked another minute or so, carmelizing the sugars in the corn and making the kernels a bright orange. 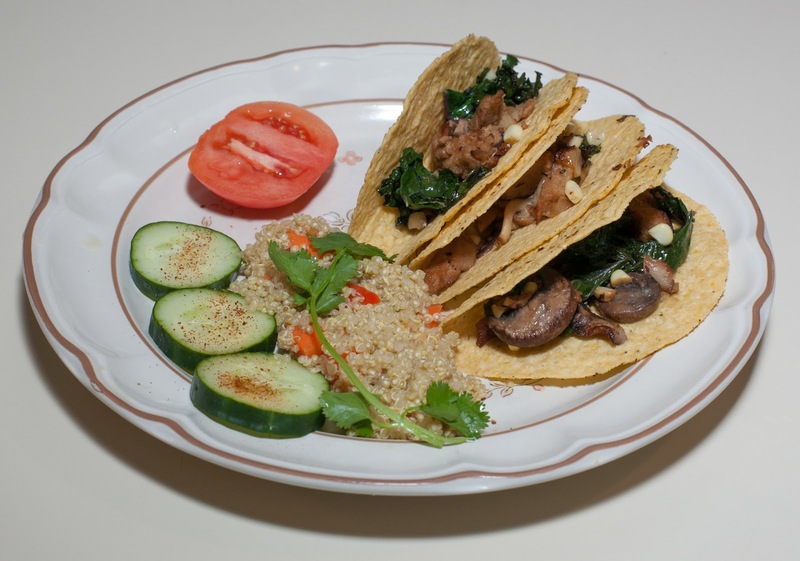 I served in taco shells, leaving hot sauce and guacamole to be added as desired at the table. Some quinoa and raw vegetables rounded out the meal. I think that everybody enjoyed the meal. We're lucky to have such nice new neighbors! My Dad has been staying with us since April 30th and will be here for a month or two before going on to visit other relatives. Today is his birthday! For his birthday meal, I started a pot of mixed brown-wild rice cooking in a rice cooker (2:1 ratio water to rice, one vegan bouillon cube, "semi-brown" setting). In a stainless steel pan, I heated a little bit of olive oil over medium heat and added a half onion, cut into 1/4" pieces. I cooked the onion for about 3m until just starting to carmelize and turn brown. Then I added a little bit of eggplant that I had left from a few days ago (maybe a fifth of an eggplant, which I cut into 1/2" cubes), cooked a minute or two (and added a little bit more oil, as eggplant soaks up oil), then added about 3 ounces of baby spinach leaves and cooked them down for about 2m. I added a pinch or two of cumin seeds, stirred and cooked for a half minute, then added half of a beefsteak tomato, cut into 3/8" or so cubes. I cooked another minute or so, then added about a half cup of French green lentils and three times as much water, plus 1/2 t garam masala spice mixture. I brought it to a boil then cooked, covered, on low heat, simmering for 40m. 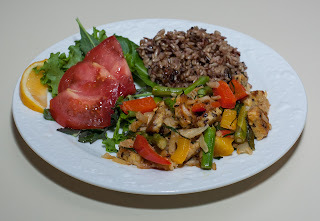 I normally would have liked to have put some jalapeno pepper in the main course - perhaps a quarter jalapeno chopped into maybe 1/4"x1/2" pieces added to the saute when I added the spinach. However, I've been reducing or eliminating hot peppers so that my toddler will eat the food. I have been adding some cut pieces of jalapeno to my Dad's plate, and, today, added some hot sauce to my wife and my lentils. We got home hungry after picking strawberries (we go to a nice organic and biodynamic farm) and I wanted to get dinner going pretty quickly. We had a plantain and that made me think of doing something tropical with black beans. Beans are great ingredients, but they sometimes don't agree with me, so I underuse them. 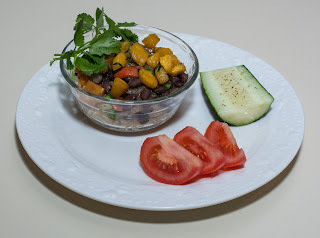 Red beans are much more likely to cause me digestive problems than black beans, so I thought I'd make a plantain-black bean dish with a starch like mashed potatoes or maybe with quinoa. I made a pot of brown basmati rice by mixing a measure of uncooked rice with two measures of water and half of a vegan bouillon cube (I needed the other half for the beans), bringing to a boil, and simmering for about 50m. Easy enough! I cut up the plantain into slices maybe a little larger than 1/4" thick, then I quartered each slice. I sauteed the plantain pieces for around five minutes till just turning brown. In the last minute, I added a generous amount of fresh chives - I think I used about 8 stalks, cut into 1" or so lengths. I moved the plantain-chive from the pan to a bowl and kept it warm in a toaster oven. I sauteed a half onion, cut into approximately 3/8" cubes, along with half of a bell pepper, cut similarly. I cooked for 6-8 minutes until the onion was lightly browned. I had prepared a half cup of boiling water with the other half bouillon cube, and poured this into the pan with the onion and pepper, along with most of the beans in an approximately 15 ounce can of cooked black beans (washed and drained), about 3/4 teaspoon of ground cumin and a few shakes of salt and lemon pepper (normal black pepper would have been fine, instead). I cooked for 5 minutes or so more, until most of the liquid was gone. I served the rice in a bowl and spooned the bean-onion-pepper mixture atop, along with plantain-chive and a half dozen or so cubes of roughly chopped jalapeno (I didn't cook the jalapeno in because my daughter probably wouldn't have eaten this dish in that case). I garnished with a few sprigs of cilantro leaves; I should also have put a small sliver of lime on the side. My Dad, who arrived early this past week to stay with us for a few months, wife, daugther, and I all enjoyed this dish. I should more often make bowled rice-bean dishes. Yum! 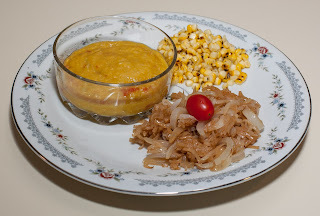 Incidentally, the recipe that I used as the base for this dish, has a description that "this is inspired by the Cuban national dish moros y cristianos (Moors and Christians)". One of my brothers came to visit last night and is staying with us through Saturday afternoon. I made a simple saute and served it with a mixed wild-brown rice and salad. Everybody enjoyed the meal!